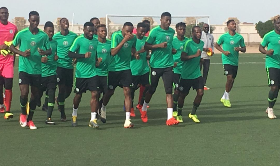 Allnigeriasoccer.com understands that there is now a full house at the Nigeria U23s camp in Tunisia ahead of their Africa U23 Cup of Nations qualifier against Libya. David Okereke, otherwise called the 'new Pierre-Emerick Aubameyang', and Bologna loanees Orji Okonkwo and Kingsley Michael are the last set of players to join the team in Tunisia. Olympic Team boss Imama Amapakabo has a big call to make on whether to start these three players on Wednesday afternoon as they did not participate in today's training session. Amapakabo has kept everyone guessing about the players he is planning to name in the starting line-up to face the North Africans as the squad was not divided into Team A and Team B in the workout which lasted for approximately one hour. Rizespor midfielder Azubuike Okechukwu was appointed captain of the Dream Team VII on Monday shortly after his arrival in camp, with Kelechi Nwakali named assistant skipper. Nigeria are the defending champions of the U23 Africa Cup of Nations and also qualified for the first edition in Morocco eight years ago.